"... transfers economic development activities to the board, removing them from the supervision of the county CEO. The commission’s actions followed a scathing report produced [by] Angelou Economics on the county’s market conditions. The report, which the county commissioned, said declining tax revenues and a culture of political corruption are holding back the county’s economic development efforts. Did you catch that: "the county’s tax digest has decreased 50 percent in the last six years as new cities have formed." The last six years counts from 2008, the year when the bottom fell out, heck broke loose, and development stalled or retracted everywhere; it's fair to guess the national economic mood had some impact on the digest, too. Still, we have to acknowledge that as commercial property leaves the County, any new (taxable) development due to recovery will also be happening and most benefiting those incorporated areas. Did you know that DeKalb is quite remarkable in terms of patent activity? This is but one slide from the Angelou Economics report. 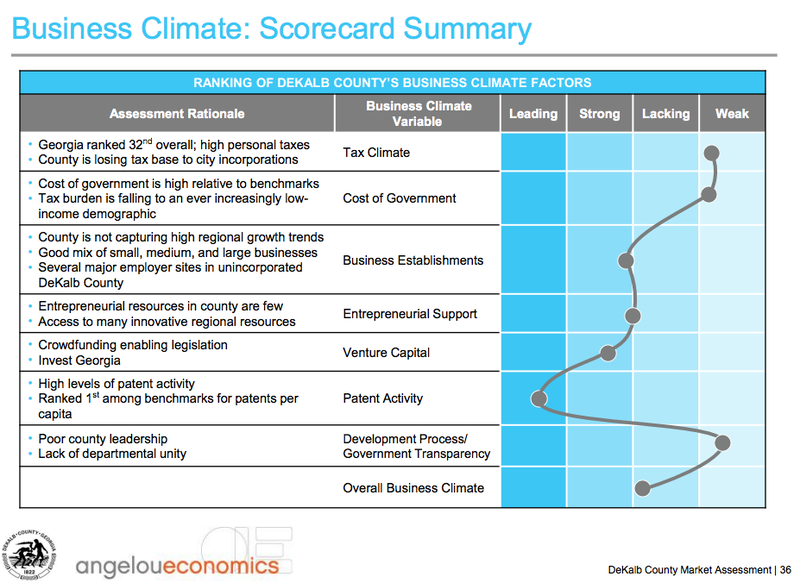 pdf/2014_02_17_dekalb_county_market_assessment_report.pdf Definitely click on that link and learn more about our County! DeKalbCustomer It is uncertain if information submitted to these surveys is still being collected.